I bring greetings from FoAM, a network of small laboratories for – what we call – speculative culture. We borrowed this term from Bruce Sterling, and describe it as a phenomenon where a diverse group of people from a range of disciplines and cultures, makers and thinkers, educators and gardeners live and work together, to prototype and experiment with possible futures. FoAM is like an archipelago of experiments in speculative culture: where groups of people tinker with different realities, or as we like to say “grow their own worlds”. Some of our islands are rock hard and become formal studios (e.g. In Brussels, Amsterdam, Stockholm and Kernow), others are more like sandy walking islets, appearing and disappearing with the flow of people, money and resources. we explore and create 'worlds', realities and total experiences. Please note my use of the plural 'realities'. In FoAM's view there is never one but many realities, or as Robert Anton Wilson called them 'reality tunnels'. We can only change, improve, destroy or neglect a narrow, local reality we perceive and live within. So when Honor asked me to speak at Improving Reality, I chose to speak about FoAM, as I live, breathe and cultivate this particular reality every day. Speaking about any other reality – especially the one with the capital R used in the title of this conference – would mean either improving an illusion as the buddhists never cease to remind us, or slicing through many individual and collective reality tunnels that I know nothing of, let alone would know how to 'improve'. What I may think of as an improvement in the local realty tunnel, someone else might find deeply offensive. However, encouraging people to find ways of improving realities (plural) or the mesh of realty tunnels is something I'm comfortable with and could even dare say that I know a bit about. Terminology clarified, let's look at the realities of the FoAM archipelago in the context of improving and re-imagining. I'd like to begin with a small exercise. I invite you to close your eyes, or look without focusing on something a few metres in front of you. Take a deep breath. Now imagine what your life would be like if this became fact rather than a hope. How would you feel? What would you be doing? What else is around to make it happen? Finally, think about how you would get from here to there, how could your reality be otherwise? What would you have to do, change, throw away? Take one more deep breath and return to the reality of here & now. This is a simplified (perhaps oversimplified) stripped down example of what we do at FoAM: we look at what is, speculate on what could be and most importantly find ways to prototype and test the various answers in something you might call a 'real life lab', an embodiment of speculation. When we started FoAM back in 2000 we began growing seedling worlds in 'mixed reality' – a place where digital media become more tangible and physical materials more responsive. Around the same time, we began our longest running initiative – groWorld, in which we attempt to minimise borders and extend edges between the human and the vegetal. Working with plants and humans necessarily brought us onto environmental issues related to the effects of human actions on the eco-systems in which we live, and a general apathy, in part due to these effects not being directly perceivable. In this case we posed the question - What if long term effects of human actions on our surroundings could be made more apparent? We designed responsive environments, where mediascapes would react to people's movement, evolving over time and with increased contact. These rather abstract environments behaved as gardens, rewarding the visitors who tended to and cultivated the media, the spaces and each other. People began creating their own myths and stories about the place they visited, talking about birds and plants and rock formations that they gradually got attached to. They would return with their friends and families and sometimes camp in there for hours, as if in an alien parkland. From generative responsive spaces we moved on to connecting living gardens with online games and most recently developed an entangled alternate reality narrative called Borrowed Scenery. Borrowed Scenery was reality re-imagined so that humans could communicate with plants, with cities as places of entangled interaction between human and vegetal: where plants don’t just provide us with food and materials but become neighbours, teachers, and even gateways to the planetary ‘Other’. It began with a story about an alternate reality (past, future or parallel) where plants are a central aspect of human society. It was a story that wanted to become reality. By 'borrowing' the setting of everyday life in the city, we attempted infuse our habitual activities, such as walking or eating, with a vision of a possible future where insatiable economic growth is superseded by an atmosphere-based economy, where nature has a voice. We created a physical narrative in an abandoned candy store and devised a series of lab experiments performed by real and fictional characters - the 'patabotanists' – people proficient in cross species communication and pollination. In the lab they studied plants and humans, they conducted field work on the streets, used an online game as a communication portal to urban foragers and remarkable plants, invaded FoAM physically and online, turning FoAM members into their research assistants and crawling over our wiki in an attempt to archive all we knew about plants as sentient beings. Borrowed Scenery invoked a vision of a possible future, where human society would be inspired by plants rather than steam machines, clocks or computers. Some of the experimenters took the human-plant communication literally and investigated what would happen when we connected our brains to plants or mushrooms, others were mapping 'plant people' of Ghent and uncovered a rich network of urban farmers, city ecologists, foragers, activists, wild fermenters and seed-swappers – a relatively invisible layer of people who are already well acquainted with their vegetal mind. Linking consensus reality with an evocative 'patabotanical world', the boundaries of possible and actual began to blur. 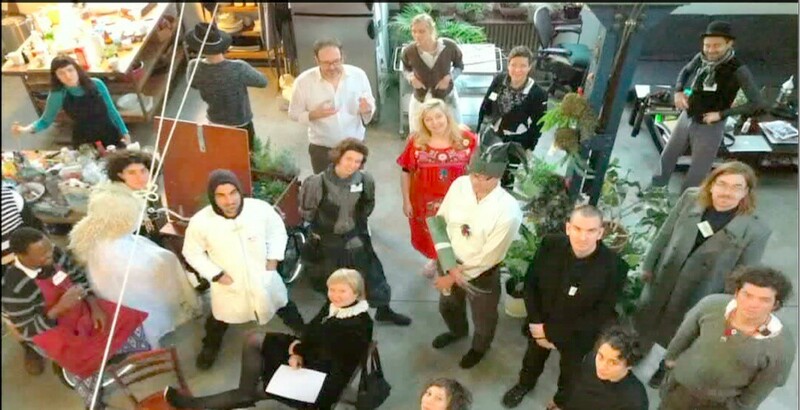 One of our visitors heard plants sing in Hildegard Von Bingen's Lingua Ignota, another occupied the patabotanists' lab and held his birthday party there. He invited his friends to a place where he felt more at home than in the grim reality of his work-life imbalance. The lab became a meeting place and a picnic ground for the staff of the Vooruit, the cultural house that hosted Borrowed Scenery for a few months. The story began receding in the background, or in some cases transforming in real things, such as vegetal dish served at a nearby cafe, or a cultural organisation planning their work according to the seasons and hours of daylight. With Borrowed Scenery we attempted to approach something that Vinay Gupta calls 'visionary adaptation' (which he will openly acknowledge as a good idea but an awkward term). To paraphrase Vinay, while we should prepare ourselves for a range of possible futures, it's just as important to envision the futures that we'd like to live in, learn from and adapt to. Stories about a possible future can steer our actions towards it. Especially if the story is designed to become a part of our daily lives, sprouting from cracks in our vintage teacups or sprawling wikis. In Borrowed Scenery we drew upon two main techniques to 'improve reality': divination and invocation. We created new plant rituals and seasonal celebrations, as well as invoked archetypes of plant-human hybrids using tarot as our starting point. We expect to see their effects in the long term, as the tendrils of vegetal culture can only be perceived in plant time. My last example presents a different approach to possible futures, more on the adaptation side of visionary adaptation. I'm talking about prototyping a wide range of realities, regardless of personal preference. In Resilients, we looked at what aspects of contemporary culture could be considered resilient in the face of environmental, cultural and economic turbulences: what should be kept, what discarded. We formed a network inspired by medieval guilds: co-operative entities that support and help develop their members' practice, circulate the knowledge via apprenticeships and itinerant journeymen and keep an archive of its past and present endeavours. In contrast to historical guilds, Resilients was devoted to keeping its sources open and crossing disciplinary boundaries. While most Resilients members chose to explore specific art practices (tactical media, edible photovoltaics or contemporary pilgrimage), at FoAM we looked at future preparedness as an art form. Being prepared for an unknowable future might sound like a paradox. But, there are some human behaviours that can help us adapt to different situations: being able to observe without judging, for example, or being aware of how we behave when stress causes our 'fight or flight' reflex to kick in. We found that getting to know our habitual patterns has to be experienced directly and consciously in order to have a lasting effect. This is easier said than done: how often do you consciously observe how you behave while you are 'behaving'? Being able to do this requires some practice, that can be learned from age old traditions such as meditation and theatre improvisation. When I ask you “what will your future look like?” Your answer is rarely based on objective fact. You will likely spice it up with assumptions, self-image, expectations and other things that colour your experience of reality. In order to think about the future less based on our hopes and fears, it can help to practice with experiencing different realities in the present. Children do this often in makebelieve games. These games are immersive situations, where you can experience what a different reality might be like. While in children's games you might take a role of a prince or warrior, when pre-enacting a future, you play yourself in a range of different situations. Here too, we can draw on existing practices such military disaster drills, LARPS and other role-playing games and historic re-enactments. But – you might ask – if the future is unknowable, how do you know which futures do you choose to pre-enact? This is where we borrow from future studies, foresight or forecasting. Futurists have techniques to help us narrow the cone of probability, as Peter Schwartz calls it. From a wide open field of possible futures they help us see which futures are more or less likely to occur. They observe constants and variables in the present and extrapolate what could potentially emerge in the future. For example, knowing that you just had lunch, it is more likely that you will soon be in need of a siesta than that an invasion of giant clams, the chronosaurus or other monsters resurected from Brighton's ancient past force landing in this room and digest you as their lunch. This isn't saying that giant clams couldn't still emerge on your event horizon, it's just much less likely. A common technique to narrow your range of probable futures is called scenario building. Starting with a “burning question” the exercise produces a series of stories about possible futures based on your current situation and various tendencies towards political, social, technological, environmental and economic changes. At FoAM we translate these scenarios into prehearsals or pre-enactments of what might come to pass. In a prehearsal the group of people who created the scenarios agree to live – for a set amount of time, say an hour, a day or longer – in a prototype of each of the scenarios. They imagine how they got from where they are now to the possible future they're prehearsing and improvise what they would do, how they would act and observe what happens to their expectations when they become reality. During the prehearsal the participants are asked to pay attention to the effects of the situation on their own behaviours and actions, as well as the situation as a whole. At FoAM we did a series of prehearsals to answer the question “how will we work together on interesting things”. Our scenarios ranged from having a Bohemian Salon populated with individual artists relentlessly pursuing their careers to The Flotilla, that modelled FoAM as a nomadic tribe, travelling the seas and revitalising cultures we encountered. The curious thing was that most of us thought that The Flotilla was our preferred future, but while prehearsing it we noticed the very problems that we have in the present resurfacing and becoming amplified, such as the difficulties of maintaining a collective vision. The prehearsal of a possible future points clearly to where its seeds lay in the present. By experiencing what they could become, we became more aware of them today, which means that we are better able to choose whether to cultivate them or not. In order to make these seeds apparent for everyone involved, after the prehearsal it's crucial to have a way to share and consolidate what each of us saw, so we identify pointers to different possible futures before they begin to unfold. We are currently continuing to explore these themes and methods in Future Fabulators, a project where we hope to find new and exciting ways to thrive in uncertain conditions and walk backwards into the future, with eyes wide open.